As you’d expect from a James Cameron production, Alita boasts stunning visuals but like Alita herself is incapable of having anything resembling a real heart within. Alita: Battle Angel tells the story of the titular cyborg who is rescued from the wreckage of a junkyard by Christoph Waltz’s Dr Dyson. This is where the story attempts, to some success, to tell a father/daughter story as Dyson introduces an innocent and joyful Alita to the 26th century Earth they find themselves in. After the first 30 minutes this story between the inventor father and the cyborg he helps restore is all but forgotten as Alita falls in love with Hugo who teaches her to play the rather uninteresting sport: Motorball. For some reason this strange gladiator ball game is the focus of a lot of the action throughout the film and worse still we are never really told the rules of the game. This has more than a whiff of The Phantom Menace’s attempt to make pod-racing a thing despite having little relevance to the rest of the story and failing to be compelling at all. Similarly, Motorball is shoehorned into the film and is even the climactic setting for the film’s finale. However, Motorball is not the biggest sin of the film. In an age where sequels and shared universes are pretty much a requisite from studios when making an expensive blockbuster, Alita: Battle Angel is the latest example/victim of this corporate greed. After 122 minutes of building the world and introducing the characters, often through expositionary dialogue, it feels like we are finally going to see Alita battle the big baddie. And then the film ends. This move seems second nature for producer James Cameron, a man who has a compulsion to creating needless sequels to his work (see the upcoming Terminator sequel this year and the million Avatar sequels on the horizon). Hinting at a sequel would have been fine but the source material feels stretched out enough over this film that it doesn’t justify this blatant sequel bating. 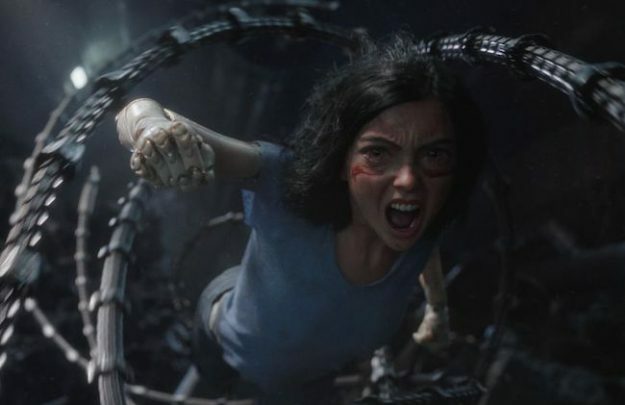 What makes Alita: Battle Angel more frustrating is there are moments of brilliance in it. For one, the bar fight (heavily advertised in the trailer, for good reason) is highly stylised fun that feels like it could have been taken from a different movie. While the film definitely has its fair share of clichéd dialogue, occasionally it appears to be self aware enough to point it out. After a particularly dramatic scene where Alita literally gives Hugo her cyborg heart he remarks after a pause, almost to the camera, “that was intense!” Whether that excuses the previously cheesy dialogue is another debate but the screenplay appears to at least be acknowledging the tongue in cheek nature of the scene. It speaks volumes about the performance of Rosa Salazar as Alita that you immediately buy into the massive eyes and strange otherworldly CGI-ness of the character. Christoph Waltz and newcomer Keean Johnson as Hugo are also able to match this heart which Salazar brings to the role but the rest of the cast are a mixed bag. Mahershala Ali is the king of understatement as the forgettable entrepreneur Vector whereas Ed Skrein makes up for this by chewing any available scenery as the laughable British bad boy and poor Jenifer Connelly doesn’t have anything to do at all. While not the disaster that it looked to be from the trailers, Alita: Battle Angel didn’t manage to be a resounding success either. An avid cinephile, love Trainspotting (the film, not the hobby), like watching bad films ironically (The Room, any Nicolas Cage film) and hate my over-reliance on brackets (they’re handy for a quick aside though).